Welcome to our introduction to meditation. Here we pull back the curtain, particularly for beginners, to simplify this mystical process. More and more of us are living in crowded urban areas or, even worse, living in the chaos of city life. We are also expected to do more in both our work and family lives. As a result of this, stress is becoming more common place. We therefore need something to release ourselves from this build-up of pressure. Somewhere we can step into for a sense of peace and relaxation. Meditation does not have to be about spirituality. It can just be about having a relaxing ‘time-out’ from our busy lives. In today’s fast-paced world, our brains are stimulated to the point of exhaustion – thinking between 60,000 to 80,000 thoughts every single day. Meditation can be seen as a ‘safety valve’ preventing overwhelm, whilst also releasing unhelpful ‘mind clutter’. It is estimated that 33% of American adults use stress releasing alternative approaches, such as meditation or yoga. How meditation can benefit you. We look at 5 different types of meditation – so that you can pick the one that best suits you. We’ll also provide the results of some medical studies. These have proven that you can reduce anxiety; and improve your body’s overall health through the regular practice of meditation. Top tips from yoga instructors. Meditation techniques from energy healers. We have taken particular inspiration from Hillary Faye and Sarah Hauch and their “Urban Meditation Guide”, which is available on Udemy. Throughout this article, we are going to provide you with 6 videos from Deepak Chopra’s “Introduction to Meditation” series. Each of these videos is less than 3 minutes long. However, that’s still enough time for you to pick up the key concepts of meditation. At the end of the article, we will provide you with some further resources, in order for you to take your knowledge to the next level and become advanced in the practice of meditation. Make you feel happier in yourself. Give you more youthful looks. Provide clarity of thought, leading to a more focused, controlled, and calm life. We already have a free 5-day course on stress. However, in this article we will look at how meditation can build up your resistance to stress. This will enable you to take a more calm and composed approach in any stressful situation. Remember, the meditation process should be effortless. It is not supposed to take over your life, it is an added benefit. However, it is beneficial if you can take time out every day to practice meditation. This article is to be read with an open mind. This is YOU time, designed for YOU. Put simply, meditation is the process whereby you connect with your true self. It is seen as a complimentary or alternative therapy, sometimes used alongside modern medicine. Too often in the western world people are looking for the answers to their problems outside of themselves. However, you have to remember that we are not 100% in control of the life outside of our own bodies. If you are looking for answers outside then you are looking for answers that have been created by other people. In reality, we should be spending more time looking inside of ourselves for the answers. Meditation gives us the quality time to be able to do that. Have the confidence to ask yourself for the answers that you are seeking. The answers are all there and they will be presented to you, given the right circumstances. We have a separate article where we detail 7 benefits of meditation. However, fut for the purposes of this article, we should accept that most people in the western world are living stressed lives (some to the point of being very unhealthy). Living in the hustle and bustle of large towns or cities, coupled with information overload, is not helping us maintain balance in our lives. This can lead to sickness and disease. The benefits of structured meditation. The immediate effect of meditation. People’s perception of relaxation is different from what real relaxation is. Slumped in front of a TV watching negative news stories or mind numbing trash TV is not quality relaxation time. This is especially the case if you have demanding children also competing for your ‘down time’. And then there is the constant interruption of texts and emails to deal with, whilst you are ‘relaxing’. We all need to calm down and maintain physical and emotional balance in our lives. Meditation allows us to recharge our batteries and reconnect. MYTH: You must quieten the mind during meditation. Don’t expect your mind to fall silent during the meditation practice; and don’t get frustrated if you can’t still your mind. It is very, very difficult to completely still your mind. It will always be ‘wandering’ and that’s okay. The thoughts are coming from your subconscious mind and the practice of meditating actually allows those thoughts to come up, and then to dissipate. That is the whole point of meditation. Think of it like having a jar of muddy water and allowing it to settle down. After a while, the chaos of the muddy water calms down, with all of the silt sinking to the bottom – leaving the clear water (i.e. the rest of your mind) on top. Think of it as your subconscious mind ‘dumping’ these unwanted thoughts – which are often just poor ‘programming’ from our past. With meditation you can simply let these thoughts go if they are not serving you. Yoga Instructor, meditation guide, and energy healer, Hillary Faye, explains it like your mind being a box, with your subconscious mind being lots of thoughts trying to get out of it. The practice of meditation is like opening a lid on the box, which allows the thoughts to escape. With the chaos now released, you can be much more creative with your mind and find answers you didn’t know were available. In other words you can have more control over your thinking. MYTH: The meditation experience is constant. People think that they are going to have the same experience each time they meditate. Sometimes your meditation experience can be deep, full of peace, and with joyful thoughts. On other occasions your experience might just be like a ‘release valve’, where you let off steam. Here, your mind chatter can be constant and quite annoying. When you first start meditating, don’t try to fight it. Do the practice without any sort of expectation. What will be, will be. With a bit more experience you can start to practice clearing your mind and being your true self. MYTH: Meditation does nothing for you. Meditation slows the aging process. We have covered stress in a lot more detail in our free 5-day course on stress, available here. Our bodies can cope with a certain amount of stress. In fact, some stress is beneficial to our lives to help us escape potential physical dangers (commonly known as fight or flight). However, today’s stressors are more psychological and come as a result of a build-up of mental pressures (i.e. dead-lines, fears, worries and uncertainties). This is not good for us. If we practice meditation (a form of stress management) over a period of time, we are much more able to tackle stress as and when it materializes. If you can handle stressful situations, then you are much more likely to go further in your career and instill confidence from others in your abilities. At home, it is beneficial to be able to handle pressurized situations and not lose your cool. Having this ability in your tool-kit might just save some people’s relationships. More likely to hold onto fat stores. Emotionally you are more likely to gain, and hold onto, weight. Your nervous system also takes a hit when under stress. Your body cells are also going to age quicker. Stress causes inflammation within the body and this can lead to all sorts of diseases. Therefore anything that can be done to reduce stress…. Clue: MEDITATION…. has to be good thing for the health of our bodies. It’s time for part 4 of Deepak Chopra’s “Introduction to Meditation”. In this video we learn about the meditation process. 50% reduction in psychiatric symptoms. 44% reduction in overall medical symptoms. In another study, brain scans showed a shift in energy from the right side of the brain to the left. It is said that people with a more negative outlook tend to be more right-sided. Meanwhile people with a left-sided brain bias tend to be more enthusiastic, have more interests, are more relaxed, and tend to be happier. 87% fewer hospitalizations for heart disease. 55% fewer benign and malignant tumors. In a final study, meditation appeared to slow aging. Those undertaking meditation for 5 years or more were 12 years younger than their chronological age. Reaching a state of pure awareness. Many people assume that meditation is just about sitting crossed-legged on the floor with palms up in the air. In fact there are several popular styles of meditation as described in the “Urban Meditation Guide”. Basically, meditation can fit in around your personal preferences and personal circumstances. For example, some people are not able to sit up straight for any length of time. One thing is for sure, you must be comfortable when meditating. If you’re not then your body is just going to be under stress and that will defeat the object. Whatever works for you WILL work for you. It’s that simple. To feel connected to the style that you opt for. It should fit you like a glove. This might not be the easiest meditation technique for someone starting out, as you will easily get distracted. However, with practice, you will be able to quieten your mind. This can be done in total silence or with light music or nature sounds in the background. Vipassana Meditation Introduction by S.N. Goenka. Click on Vipassana Meditation for more information. There are also several Vipassana retreats around the world, where you can learn to meditate in tranquil surroundings. As the title suggests, this type of meditation requires that you listen to an audio recording of someone guiding you through the meditative process. Here is a short demonstration example of guided meditation. Relax and enjoy. Free Guided Meditation – A Soothing & Relaxing Moment of Tranquility. Binaural rhythms are frequently used here. They are designed to get you into the theta state. Another sound meditation is that of using crystal or Tibetan bowls. Here’s an example (Read the instructions at the start of this video). Candlelight Meditation with Himalayan Singing bowls. This one might come as a surprise to many people who are new to meditation. However, you don’t have to sit cross-legged on the floor or flat on your back to experience meditation. You can actually move about and still be meditating. This is particularly useful for people who can’t sit still, or get uncomfortable, or restless, when doing the other forms of meditation. Demonstration: Zhan Zhuang Qi Gong – Standing Meditation. Here are two more videos which form part 2 of Deepak Chopra’s “Introduction to Meditation”. Of course the above videos are merely demonstrations. They are not enough for you to say that you’ve ‘done’ your meditation for the day. Here is part 6 of Deepak Chopra’s “Introduction to Meditation”. In this final part Deepak summarizes the meditation process. WARNING: Do NOT just dive over to YouTube for meditation guides!!! Think about what you are doing and (more importantly) WHO is instructing you to do it. YouTube videos can be great but please be careful who you are watching on there. Whilst we have included a few videos within this article, not all people who upload videos to YouTube are qualified to demonstrate the various meditation styles. It could leave you feeling more stressed, or even injure you. You are far better off seeking guidance from a recognized teacher of the meditation process. With this in mind, we have included a few additional resources below should you wish to take your knowledge further; or should you wish to start practicing meditation with an experienced tutor. If you are looking for even more information on meditation, then there are some fantastic online, and very affordable, courses. You can follow along in the comfort of your own home, and many even provide you with a certification at the end of the course. Pick the one that best suits you and you can be starting in the next 5 minutes. Each box-set has 6 CDs. Everything you need to for the perfect meditation experience. Many people just haven’t got the time for 45 minutes of meditating. 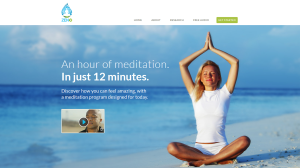 What about having an hour’s worth of meditating reduced into just 12 minutes? That’s EXACTLY what you get with the amazing Zen 12 program. You can read more about it by clicking on the image below (if you don’t want to opt-in to the free download, to can click “skip this gift” at the bottom of their page). Then you will qualify for ALL of our 66 free personal development ebooks (over 2200 pages). To see how to claim this fantastic offer, click on our Free Ebooks Page (opens in a new window). Whatever meditation method you choose, you will find that (very quickly) your body easily finds the meditation posture (through ‘muscle memory’); and you should then comfortably slip into the meditation state. Less tetchy and less likely to snap at others. Less likely to get overwhelmed. All-round feelings of peace will envelope you. Just like working out your muscles at a gym, you wouldn’t just do it a couple of times and think “I’m done”. No, you have to keep doing it. However, the benefits get exponentially better the more you meditate. We hope that you found our introduction to meditation useful. Please help us by sharing, using the social media links below.